Prepare for lingering snowpack well into the spring. Roads closed in winter. 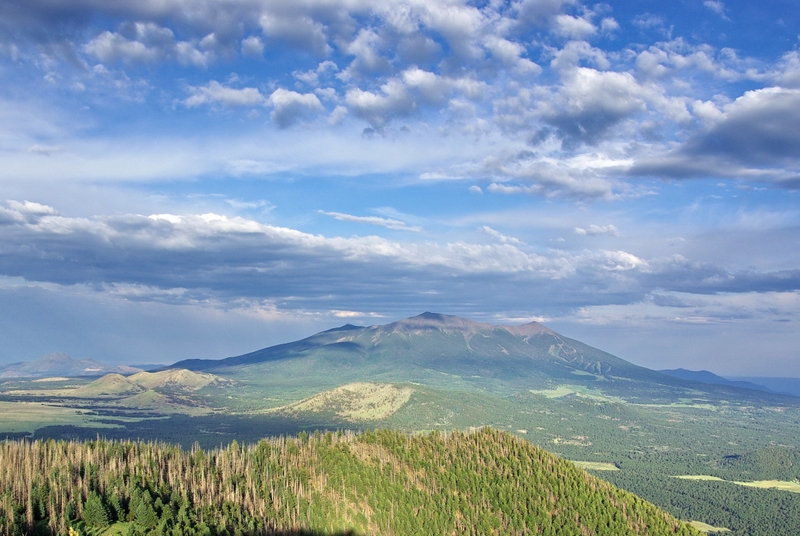 Kendrick Peak is an old volcano that rises proudly above the Northern Arizona plateau near Flagstaff. 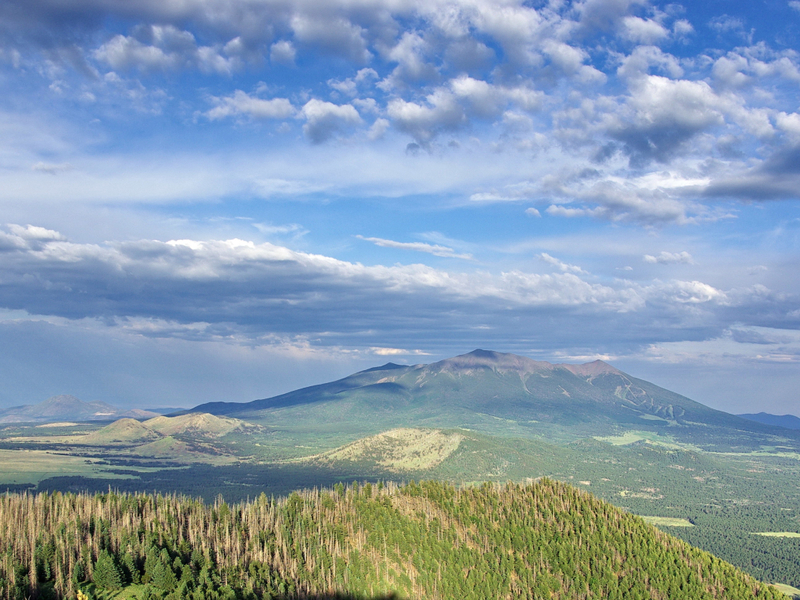 Though it appears small in the shadow of the nearby San Francisco Peaks, Kendrick is actually among the tallest in the state at over 10,400 feet elevation. Of the three routes to its summit, Bull Basin is probably the least traveled, but no less spectacular than the alternative Pumpkin Trail or Kendrick Trail. About one hour from Flagstaff, Bull Basin is near Pumpkin Trail and these two together make a challenging full-day loop to the top of the mountain and back down. Kendrick’s summit is hard to beat. From the flat viewing platform on top, you can see all the nearby volcanic hills, gaze across the vast plains, and even see into the Grand Canyon on the horizon. Kendrick Trail is the most direct route up the mountain, but the 4.5-mile Bull Basin offers advantages of more diverse scenery and fewer people. In fact, you are unlikely to encounter anyone else along most of this trail. This is within the Kendrick Mountain Wilderness Area, out of reach of any roads or bike trails. Begin by ascending a drainage on Kendrick’s northwest flank into a massive burn area left from a fire in 2000. Soon the trail meets a connector and traverses eastward to Bull Basin. The north-facing basin has the coldest slopes on the mountain, and the vegetation shows it. Notice the aspen trees springing up on burn area’s margin, which quickly gives way to true alpine forest of spruce and fir. Relish the shade as you grunt through the final push to the top, where you can take in massive views above the trees, provided by an old tower foundation that is now a cleared platform. There is a fire tower up here that is manned during the summer. Though it is not generally open to the public, a friendly lookout may let you visit. Mountain lovers seeking solitude should take Bull Basin to get a quiet experience of this under-visited mountain. If you have hiked the standard Kendrick Trail before, you will likely be impressed at the very different journey that Bull Basin offers to the same summit, and the summit never gets old. The trail is moderately strenuous, with steady elevation gain for its entire length. You should be properly equipped and physically prepared to take this one. Most do it as a day hike, but a cool place to camp is at the historic lookout cabin on the mountain’s saddle. From Flagstaff, take US-180 to mile marker 230 and turn left on FR 245. Once on this dirt road, follow signs to Kendrick Peak. Pass the signed turn for Kendrick Mountain Trailhead on the right and continue four more miles to a right turn on FR 149. Take this for about one mile. You will arrive at what is actually the Pumpkin Trailhead, but this is the best way to get to Bull Basin because the road to its proper trailhead is longer and rougher. A connector trail forks off toward Bull Basin after about one mile and the mileage is the same.